LedZeppelinTickets.com is commemorating the 38th anniversary of the 1975 release of the Physical Graffitti LP with a special deal for Led Zeppelin fans everywhere. In 1994, Jimmy Page and Robert Plant embarked on their first major tour since the demise of Led Zeppelin in 1980 with the release "No Quarter." 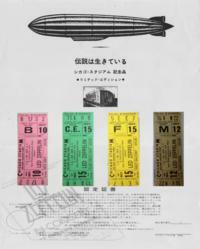 The tour was a worldwide affair and LedZeppelinTickets.com created a special Japanese version of the 4 ticket set. These authentic tickets are from the last show ever, cancelled due to the death of John Bonham. Bonham's death fell on the very day the tickets were to be sold, mail order only, to celebrate both the event as a marker for the year that the Chicago Stadium was demolished. The place where the band enjoyed its greatest successes was the Chicago Stadium in Chicago. LedZeppelinTickets.com is offering a very limited number of these 4 ticket sets for $100.00 per set. You will receive a hand signed certificate and four different tickets in four different color coded sections suitable for framing and shipped anywhere in the continental US. Please call Michael E Dehn at 312-520-0204 to order this special offer as supplies are very limited and this price is valid for a very short time. Phone orders only for this special offer. Call today to reserve your piece of rock and roll history. For more information, please visit http://www.ledzeppelintickets.com.